This easy Vegan Banana Bread is perfectly moist and not overly sweet. Although it is dairy-free and egg-free, nobody can notice this. The house smells like fall when it is in the oven. Ripe banana, allspice and walnuts make it so tasty that my non-vegan friends and family love it! 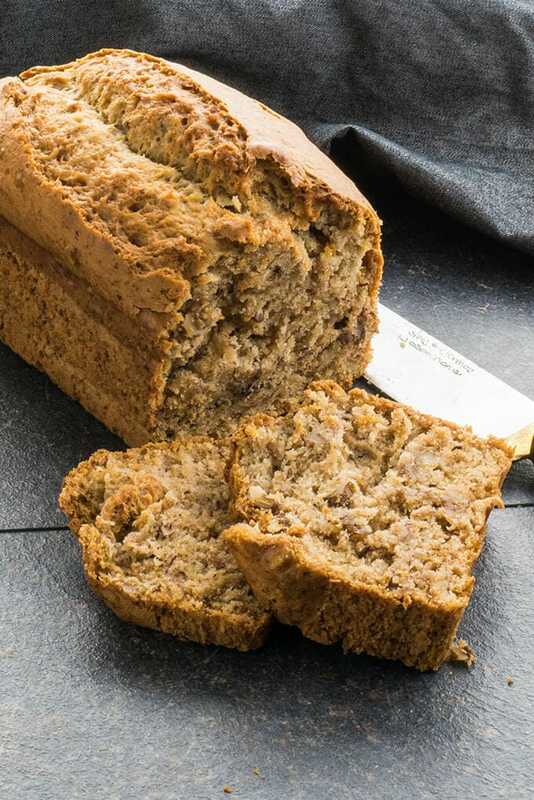 If you have ripe bananas waiting on the counter, use them up for this vegan banana bread recipe. 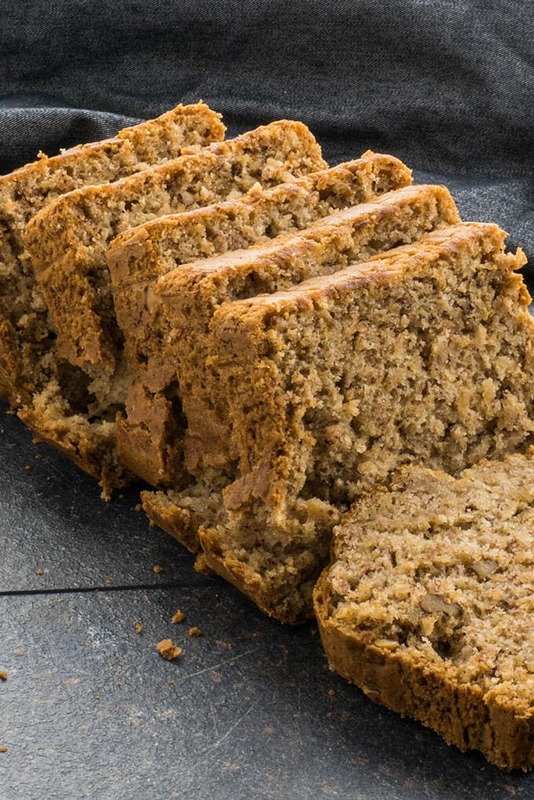 It doesn’t matter whether you are vegan or not, go ahead and bake this bread for your family! 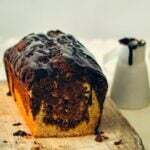 You will be amazed when you see almost no difference between this one and your favorite Marbled Chocolate Banana Bread that is made with eggs and dairy products. This surprisingly wonderful eggless and dairy-free banana bread disappeared very fast and I need to make it again very soon. To make it even more tempting, you could top your bread with a vegan chocolate ganache if you want. Why vegan banana bread recipe on this blog? 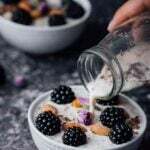 Please read my post Homemade Almond Milk where I mentioned how our son had to follow a dairy-free and egg-free diet when he was 2. I tried vegan recipes for him so that he could still enjoy what he ate. Vegan cooking and baking has never ended in my kitchen since then although nobody in the family is vegan now. This is one of the best vegan banana bread recipes I’ve tried! You won’t believe it’s vegan! Seeing that my son didn’t like my homemade almond milk, I decided to use it in my baking and include it in his diet this way. I needed to find a way to use my leftover almond milk as wasting food is not my type of thing. There is more almond milk than suggested in the original recipe and it gave a really nice moistness to the bread. Also, I reduced the amount of sugar as the bananas I used were really sweet and we didn’t want an overly sweet bread. Well, you might find it not sweet enough if you like your cakes very sweet. If so, use a little more sugar or another plant based sweetener like maple syrup or agave. Finally, I liked the idea of adding walnuts in this vegan banana bread. It gives a great crunchiness and the bread becomes even more nutritious this way. This recipe proves that vegan food can be heavenly too. Try it even if you aren’t following a vegan diet or you will be missing a lot! Amazingly yummy, moist and nutty vegan banana bread. Preheat oven to 350F (180C). Line a 9×5 inch loaf pan with parchment paper. In a large bowl combine flour, baking soda, salt and spice. In a small bowl combine almond milk and apple vinegar, put aside. In another bowl mix sunflower oil and sugar. Add in mashed banana, vanilla and almond milk-vinegar mixture. Add the wet ingredients to the flour mixture. Stir in the walnuts. Don’t overmix, stir until just combined. Pour the batter in the loaf pan and bake for 1 hour 15 minutes or until a toothpick inserted in the center comes out clean. Just check it after 60 minutes as oven temperatures might differ. Remove the pan from the oven and place it on a cooling rack for 15 minutes and then remove it from the pan. I tried this recipe and I’m really impressed with the results , I added semi sweet chocolate chips and used white vinegar instead. Will definitely be following this recipe again. Found the recipe on pinterest, it has great reviews! Can’t wait to make it tonight! I am not a vegan but i prefer eggless cakes. And this one turned out perfect. Thanks for the recipe. I’m so glad to hear that Faizah! I’m not a vegan, either but sometimes we don’t need to be vegan to enjoy vegan foods, right? Thanks for the comment! Hi Romi! I’m so happy to hear that you love the recipe. Thanks for sharing what changes you made. Really helpful for others. Can I make this as muffins instead? Hi Tami! Yes, you can. Gave this a go and it’s bloody lovely. Great recipe! We’ve gone almost all plant based in the last few years and I’m constantly amazed at recipes that turn out so wonderfully with no eggs or dairy! I don’t miss the dairy at all, but I have to admit that I do miss the eggs on occasion and will still pop them into some of my baking. I’m so glad you are finding recipes that work for your little guy. Too bad about the almond milk, but keep trying. When we had to switch milks it took a few weeks for my kids to get used to it.